A Spanish coat of arms can be found in the stone wall near the entrance of the convent. 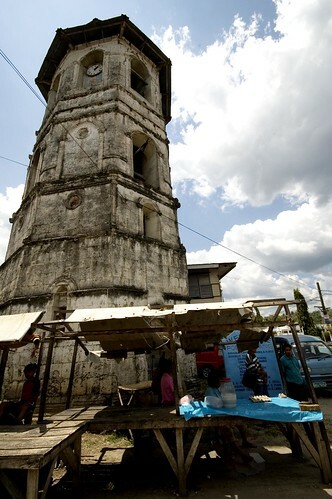 The bell tower of Loboc is about 100 meters from the church. Attached to the building is a three storey convent, which today houses the Museo de Loboc on the third floor. This museum houses a few old statues of saints, and some other antique religious artifacts. In Loboc, you can also admire a shameful witness of wasteful planning. Exactly next to the church is a partly finished bridge across the river. Hopefully, this bridge will never be completed, as, to do that, the Church will have to be destroyed. Loboc is 21 km east of Tagbilaran. 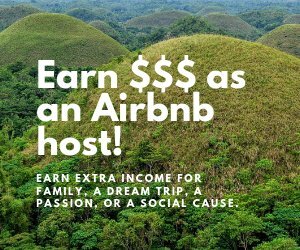 Catch a bus to Loboc, or one in the direction of Carmen, and ask the driver to drop you off at the church. In 1596, the Jesuit Gabriel Sanchez gathered together 12 separate settlements to form one town in the interior of Bohol at a site where villagers from the mountains met to trade with those from the coast. Sanchez convinced the villagers to build a church of wood and thatch and to win their goodwill gave them trinkets, needles, beads and other small gifts he had brought. In 1602, Loboc was apparently constituted as a pueblo. 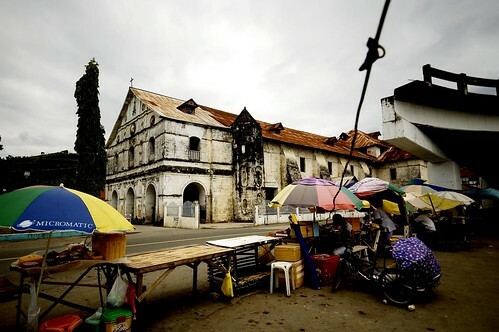 During the early 17th century, Loboc became well known as a pilgrimage site, because the saintly priest Alonso de Humanes was buried in the church. A stone church was built ca. 1632 but was damaged by fire. A newer and bigger church was completed in 1734. 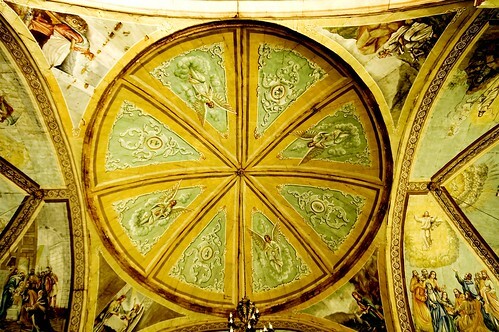 It was apparently in the process of being decorated with carvings when the Jesuits were expelled from the Philippines. 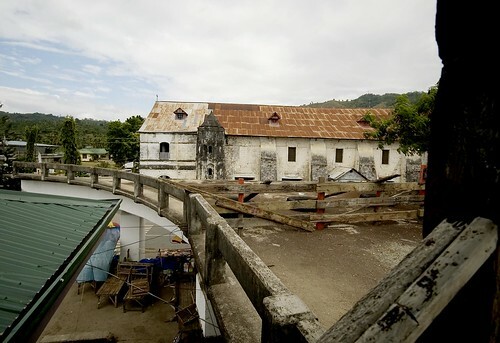 Loboc became the residentia or center of the Jesuit missions because it was deemed safer from slave raids than the coastal towns of Baclayon and Dauis where at one time the residentia was located. The Recollects succeeded Jesuits in their ministry to Loboc in 1768. Fr. Aquilino Bon built a hexagonal bell tower located at a distance from the church. He added a portico and in effect covered the Baroque façade of the Jesuit church. The Recollects installed a pipe organ in the church in the 1820s. Parts of the L-shaped convento behind the church may trace to the Jesuits, although an 1886 document credits them with building the convento which is described as "de much solidez y capacidad." 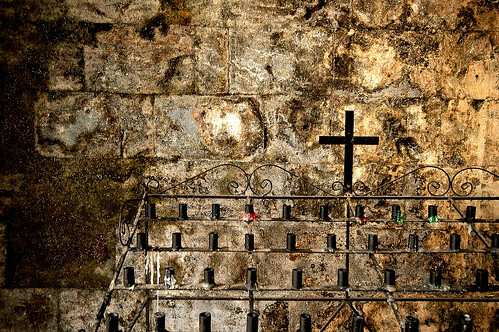 The convento is unusual for being three stories rather than two as is more common. 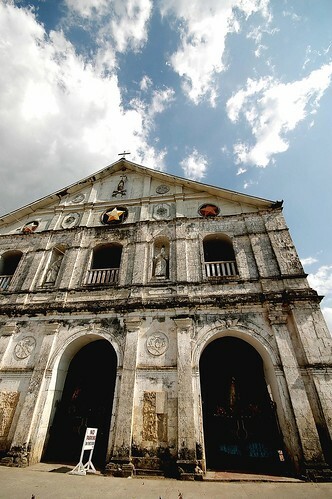 Heritage Features: The Loboc church is decorated with carvings of cherubs, the Papal tiara and emblems of the Jesuit. It has two facades: the Jesuit-built Baroque façade decorated with unfinished medallions depicting saints and the Neoclassical portico added by the Recollects. Although main altar is Neoclassical, two side altars are Baroque and two at the transept ends are put together from several parts, creating a syncretic style. 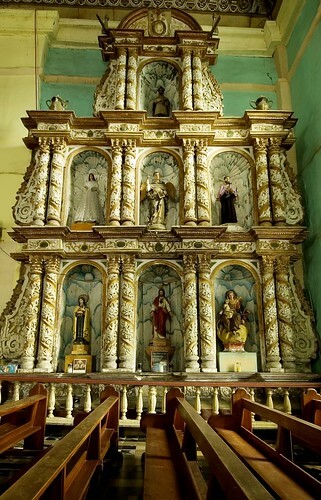 Many of the saints of Jesuit devotion have been replaced by saints of Recollect devotion except for the image of San Francisco Xavier found at the side altar to the right of the main altar. Hidden by the main altar, is a bas relief of San Ignacio and San Francisco Xavier done in stucco (reminders that this was once a Jesuit church). Dome from the inside. Loboc Church. The sacristy behind the main altar is also decorated with relief. A greatly deteriorated bas relief over the door show a scene with a number of persons: probably Jesus and the apostles or Jesus with Jesuit saints. Part of a retablo whose pediment is embellished with Veronica's veil and a crucifix decorate the interior. Stone stairs lead to upper story, which the Jesuits probably used as a residence. 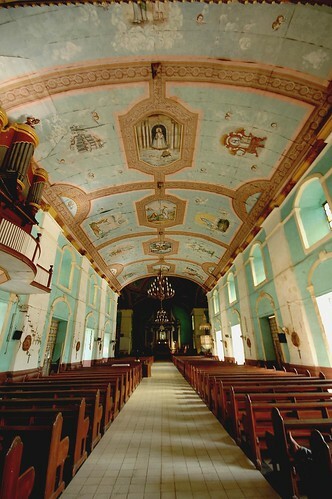 The convento built behind the church, though needing much conservation, has a number of pleasing features, namely, a large sala with decorated walls and a stamped tin ceiling, a dining hall with large armoire and a connecting hall whose covered balcony is decorated with colored glass panes and a gilded ceiling. Loboc has a small museum on the third floor. On the way to the museum are gargoyle heads one painted a deep blue.